In 2016, I visited NGO Husk’s community and school hub in Kompheim, Cambodia where I worked with local people in the sewing room and classrooms. Fiona and Anthony Jaensch warmly welcomed our group and shared the programs for building well being, literacy, financial skills and environmental conservation. In an article written by Kezia Parkins and published in the Phnom Penh Post, Fiona and Anthony tackle environmental and societal issues in partnership with the local community. It is a problem in need of a solution, and one that Fiona and Anthony Jaensch noticed when they moved to Siem Reap 11 years ago to open a guesthouse. Coming from Australia, the couple were familiar with Keep Australia Beautiful, a grassroots campaign that has worked there for 45 years to reduce litter and help the environment. Cambodia had nothing like it, and there was little awareness of the environmental issues and health risks associated with pollution. After several years of raising funds for water filters and partnering with agricultural NGO Trailblazer Cambodia, the Australian duo joined forces with a Cambodian couple: Lim Leangsreang and Proeum Srey Leak – a former employee at their guesthouse – to form their own NGO: HUSK Cambodia. The proliferation of plastic was the focus, and the team followed a Guatemalan program that uses plastic bottles to build schools. In 2011, they constructed their first “bottle-building”: a medical clinic for new mothers in Treak village – four kilometres outside Siem Reap. It was also the country’s first bottle-building. The following year, they built a community school in Kompheim village, some 18 kilometres from the provincial capital. Its three classrooms provide free English classes to children from the area; it also has an income generation workshop, a library and toilet facilities. 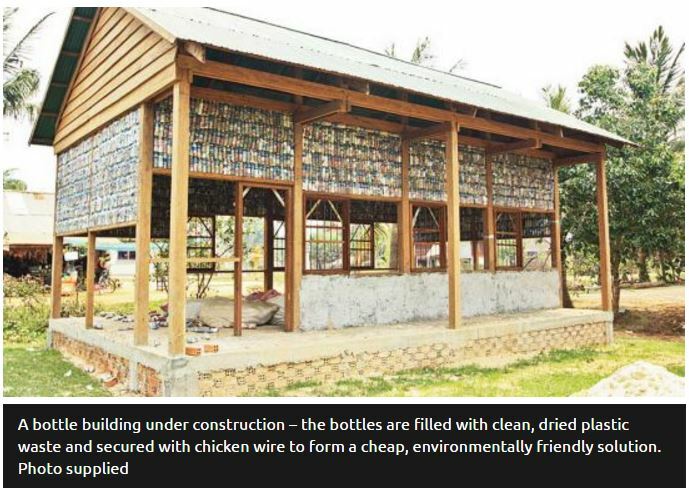 For communities with no access to rubbish collection – and that’s the vast majority in Cambodia – bottle-buildings are a smart fit. HUSK’s Cambodian employees take the donated plastic waste – such as straws, bags and food wrappings – to villagers who have been trained in drying it and packing it into bottles. The bottles are then bound together with layers of chicken wire before layers of cement are applied to the outside leaving the building looking like any other. In return for these ‘eco-blocks’, the families are paid in rice, oil, school uniforms or bicycles. The result: less litter, cleaner villages and improved local infrastructure. HUSK’s next project is a centre in Kompheim village that needs 14,000 bottles, and that will provide free programs on nutrition, dental health, hygiene and financial education. It should open by the end of the year. For Srey Leak, who started working at the Jaensch’s guesthouse in 2005 as a dishwasher with limited education and no English and ended up managing it, the focus on the environment has been valuable. See HUSKCambodia.org for more information.